The 15966 is a charger typically used at the PC where ac power is available. The 14291 power cable terminates in a barrel plug on one end and two pigtails on the other end. The 15731 is a 0 dBd gain 1/4 wave helical antenna with an RPSMA connector designed for use with radios operating at 900 to 935 MHz. This small, low-cost antenna is typically used in applications where space is constrained and antenna gain is not required to maintain a strong RF link. The 15730 is a 900 MHz, unity gain (0 dBd), 1/4 wave whip, right-angle antenna. The 15730 is an omnidirectional antenna that attaches directly to the product (no cables). It should be used inside an enclosure or building. The 14204 is a 0 dBd gain 1/2 wave antenna with an RPSMA (reverse polarity SMA) connector and articulating base. It is designed for use with radios operating at 900 to 930 MHz. This small, low-cost antenna is typically used in applications where space is constrained and antenna gain is not required to maintain a strong RF link. The 15970 is a 1 dBd, omnidirectional antenna. Its adhesive backing adheres to a wall, rear-view mirror, window, or another suitable flat, non-conductive surface. This antenna should reside inside a building or enclosure. The 14221 is suitable for base station use where you need to communicate with multiple stations located in different directions. It is also preferred in mobile applications and in other applications in which the best radio path is not constant, including close-up applications without clear line-of-sight. The 14205 is a high-gain (6 dBd), directional (Yagi) antenna. It is useful for making RF links over longer distances in one direction. The 14205 requires an antenna cable to connect it to the spread-spectrum transceiver. The COAXRPSMA-L is an LMR195 coaxial cable fitted with a Type N Male connector on one end and a Reverse Polarity SMA (RPSMA) female connector on the other end. This cable is commonly used to connect an antenna with Type N connector to a spread-spectrum radio with an RPSMA connector. 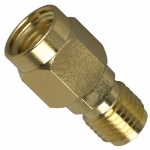 The COAXNTN-L consists of an RG8/U, low-loss coaxial cable fitted with a Type N Male connector on each end. It can support any 50 ohm transmission line application. The 31314 is used with the COAXNTN-L. The 31314 is an RF surge protection kit with flange mounting bracket. It may be flange-mounted to an enclosure backplate or bulkhead-mounted through an enclosure wall. One side of the surge protector connects to a radio with an RPSMA antenna connection. The other side connects to an antenna/antenna coaxial cable with Type N connector. This 10-ft roll of black self-vulcanizing tape is used with non-whip antennas and/or surge suppressor kits to protect antenna connections in RF, cellular, or satellite networks. When the 20625 is purchased, the customer receives a Freewave Diagnostics & Programming Cable and a CD containing Freewave Software. These items allow advanced users to perform Network Diagnostics. This 1 ft, null modem cable has 9-pin connectors on both ends for connecting the datalogger's RS-232 port to a peripheral's RS-232 port. An interface such as the SC105 or SC932A is typically not required. The 32016 is an adapter with an RPSMA plug on one end and an SMA jack on the other end. It can be used to connect antennas or antenna cables with SMA plugs to the RF451. The 17648 is a USB cable for attaching our products to a USB port on a PC. It has a type A male connector for connecting to the PC's USB port and a type B connector for connecting to the Campbell Scientific device.